Blog Which G Chord Is Right? There are a few different ways to play the open G chord, and the truth is, there is no right or wrong way to play this chord. All of the different versions are real G chords, but there are songs where one version is more appropriate. It’s good to be familiar with all of them, and to know when to use each one. 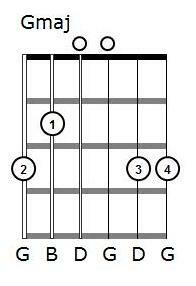 There are 4 different kinds of open G chords that you’ll run into in rock and folk music. Also known as “Country G,” this one requires the use of all four fingers, and is the one I like to have my students learn. 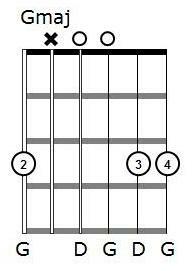 There’s a lot of songs that use this chord, because you can leave your third and fourth fingers down and move your first and second fingers around to get other chords. You’ll find this chord in songs like “Wonderwall” by Oasis (and in fact a lot of Oasis’s songs) and a lot of Taylor Swift songs. This one is the one a lot of people start with, and is easier since it only uses three fingers. It’s fine to use this one, but if you’re playing a song that has Cadd9, Em7, or A7sus4 in it, you’ll need to use the four finger version instead (and the tab should relay that infor to you via the chord diagrams on the first page). This one is less common. 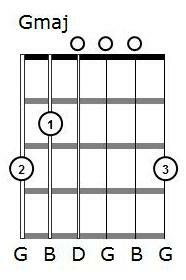 You play this chord without the index finger, and use the second, third, and fourth fingers to play the same notes in the previous version of G.
This makes it easier to quickly move to the C chord and back. 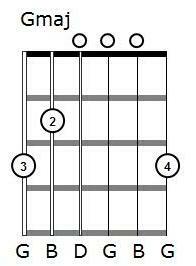 You should use this version of G for songs like “Me and Bobby McGee” and other songs where there’s a quick change between C and G.
Aka, “Rockin’ G,” aka “AC/DC G,” this is technically not a G chord, but is a G5 chord since there is no B note. This is a good one to use if you’re playing electric guitar with a lot of overdrive or distortion. The lack of major and minor third intervals in the chord gives it a cleaner sound (although cleaner is probably not quite the right way to describe it – fewer overtones maybe?) that does better with overdrive. As I said before, all of these versions of G are valid ways to play an open G chord, Which one is the correct one simply depends on what song you’re playing. Questions? Feel free to leave a comment.